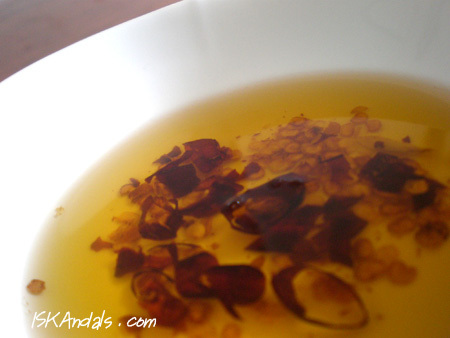 I love the hot chili oil they serve in Chinese restaurants. I believe it’s Szechuan – normally served in a condiment platter when you order a certain type of dish like dim sum or duck. Sometimes, you help yourself and get more from the condiment counter, contained in a glass jar. Exactly how we do it! A couple of months ago I had lunch with some of my Asian colleagues in a newly opened Chinese restaurant in Newmarket. Two of them are from Mainland China, specifically Guangzhou and Dalian. As usual we kept on requesting for more platters of chili oil. Agawan at ubusan baga. Suddenly, and after meals after meals after Chinese meals in a span of 3 years in NZ, I asked, “Where can I buy this stuff?” “Oh no, no,” they replied. Apparently those being sold in groceries are not the right kind. And that I can prep it myself! I quickly grabbed a pen and paper and took notes while they explained the process to me – home-style! 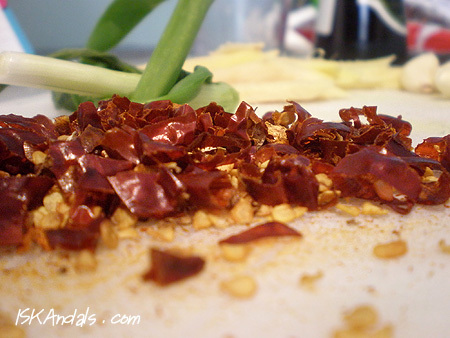 The basic ingredients – dried chili you can buy in a packet from any Asian dairy, garlic, ginger, spring onion and any kind of oil. “What? !” I was surprised, thinking it should be a specific type. They explained it is just ordinary oil infused with chili. Oh well, why on earth should I argue with their recipe passed down from one generation to the next? There’s also the option to add a tablespoon of sesame oil. Those who have low tolerance for spicy food (I consider myself one!) don’t get intimidated. It may be mean looking but it all depends on how much you put on your dish. As the saying goes… all thermometers are not created equal, especially when it comes to food. Sa tagal-tagal, nung Lunes ko lang nagawa. Success! Heat oil in a pan but not until smoking hot. Add ginger, garlic and spring onion. Turn off the heat and remove from heat if you think it is getting too hot. Throw in the chili flakes and seeds. (You may discard the seeds if you wish but my friends told me I don’t have to.) Add sesame oil. Be careful not to burn any of the ingredients. Make sure oil is just hot enough to absorb all the flavors. Remove pan from stove and when cool enough, scoop out garlic, ginger and spring onion. Transfer into a glass container and cover with a lid. They say it’s best after a day or two but I had it right away. Sawsawan sa aking tirang sinigang, Grabe lalong sumarap! You don’t need to refrigerate this stuff. Sealed container, room temperature, that’s it, and it will last for a month. Love it on noodles, dumplings, meat dishes (adobo!) and what have you. Enjoy! 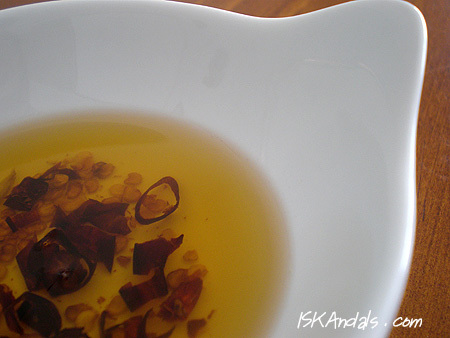 Hot chili oil to spice up whatever you're having. Heat oil in a pan but not until smoking hot. Throw in the chili flakes and seeds, and sesame oil. Be careful not to burn any of the ingredients. Make sure oil is just hot enough to absorb all the flavors. Remove pan from stove top and when cool enough, scoop out garlic, ginger and spring onion. Transfer into a glass container and cover with a lid. 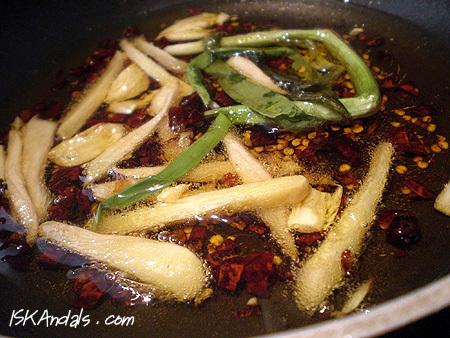 Allow for a day for more flavor to infuse into the oil. No need to refrigerate. Sealed container, room temperature, that’s it, and it will last for a month. 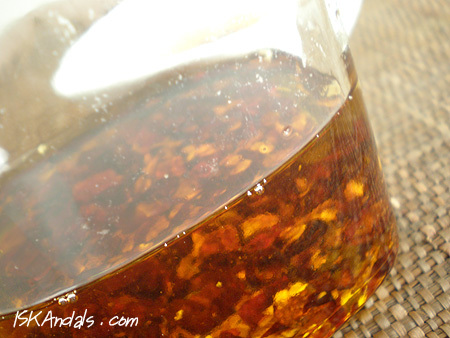 hmmm, chiu chow chili oil? — this one calls or soybean oil…nywei this looks really good! Lee Kum Kee? Haven’t tried that one yet but colleagues told me those taste different. Try ko din, I’m sure masarap din kahit iba. You’ll love it, Jeanette! Thanks to my Asian friends!